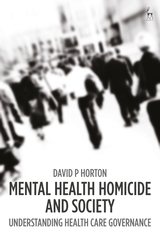 A homicide perpetrated by a mentally-disordered person under the care of health services is a shocking event. Otherwise known as a 'patient homicide', these events attract investigatory responses that are widely understood to be episodes of procedure that seek the truth about what happened and promote the learning of lessons. This monograph however incorporates systems theory into its novel theoretical design and argues that these events are communicated about within closed systems of life (eg, law, medicine). These systems operate through unique internal logics. Yet, they resonate in society and enable a contingent and chaotic space of governance to emerge in which universal understandings about patient homicides and the realisation of pre-defined goals to minimise their occurrence is unachievable. The book is timely because the Scottish Government initiated a process of reforming their patient homicide investigation procedures in 2017. In England more recently, plans to reform patient homicide investigations are slowly germinating. Original and compelling, the book concludes that policy makers should re-evaluate their normative commitments to improve public safety and health service quality in a world of disharmony, objection, and resistance. David P Horton is Lecturer in Law at the University of Liverpool.